Create the perfect day, in which every single second is a timeless moment one will cherish for a lifetime. To make one’s dream wedding come true, JW Marriott Hotel Macau and The Ritz-Carlton, Macau present a series of thoughtfully curated wedding packages including a brand new Outdoor Wedding Ceremony offer as well as the new bridal shower package by ESPA at The Ritz-Carlton, Macau, giving couplesan incredible way to create the most romantic day of their life. Celebrate love in a magical setting where time stands still and a single memory lasts a lifetime. JW Marriott Hotel Macau ensures every detail is meticulously attended to, offering a choice of pillar-less Grand Ballroom, exquisite dishes and the most attentive service to ensure the special day is as momentous as couples’ imagined. To help couples tailor-make the wedding of their dreams, JW Marriott Hotel Macau has a selection of four wedding packages — Symphony of Romance, Symphony of Harmony, Symphony of Love and Symphony of Eternity. Various packages will include Chinese and Western dining options, a photo session on the Grand Resort Deck, a dedicated bridal butler on wedding day, a bottle of bubbly for toasting, wedding gifts for every guest, exclusive offerings and rewards points to enjoy a vacation experience at 6,700 magnificent hotels worldwide after the big day. The Ritz-Carlton, Macau makes every wedding a truly unforgettable experience with lavish venues, specialized event professionals and custom wedding packages. The Ritz-Carlton, Macau’s splendid wedding facilities span the elegant pillar-less Grand Ballroom accommodating up to 400 guests, dedicated banquet and catering team, more intimate spaces for bridal showers and rehearsals, and spacious suites to host the entire wedding party. The Ritz-Carlton, Macau introduces three charming wedding packages — The Pearl Wedding Package, the Jade Wedding Package, and the Crystal Wedding Package. Each package can be tailored to meet couples’ specific needs and comprises a full suite of services and amenities before, during and after the big day. Included are an experienced wedding executive and on-site floral design expert, complimentary menu tastings, a bridal afternoon tea gathering, preferential rooms rates, valet services, a customized wedding menu and more incredible offerings. The Pearl, Jade and Crystal Wedding Packages invite couples and their guests to indulge in an exquisite culinary voyage with a wedding menu from the Michelin-starred Lai Heen restaurant. This elegant yet authentic Chinese menu features a sumptuous array of mouthwatering dishes such as the signature double-boiled black chicken soup, sea whelks, mushrooms and dendrobium nobile, all meticulously prepared from the finest, freshest ingredients. 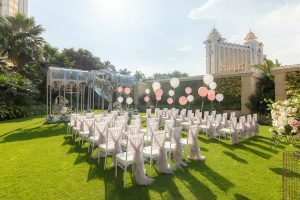 A brand new Outdoor Wedding Ceremony offer is now launching from JW Marriott Hotel Macau and The Ritz-Carlton, Macau, offering brides and grooms a bounty of enduring moments they will remember forever. Happy couples can tailor-make the wedding they have always pictured, whether it is a classic and refined traditional ceremony with a gorgeous setup on the lush green lawn, or an outdoor cocktail party brimming with love and laughter. Make the vows under the sky, then celebrate with drinks, canapes and dancing. The package includes a personalized wedding concierge for the bride and groom, usage of the lush outdoor lawn area. The bride-to-be and her closest friends and family are invited for an indulgent afternoon of pampering and fun with the Bridal Shower Package by ESPA at The Ritz-Carlton, Macau. The experience starts with an exquisite bridal shower-themed afternoon tea in a Poolside Cabana, next to the mesmerizing blue-green waters of The Ritz-Carlton, Macau Pool. This is the perfect chance for the bridal party to chill out and truly celebrate the joy of the bride-to-be’s new life chapter in their very own tropical retreat, sipping a glass of champagne and sampling the tailor-made bridal shower cake. Following the poolside festivities, each girl will receive a personal consultation at the award-winning ESPA Macau to select her tailored choice of signature ESPA Aromatherapy Massage, using a blend of individually chosen oils. Custom treatment options to suit specialized needs include Detoxifier, De-Stresser, Muscle Relaxer, Jet-Lag Reviver, Immune Booster, Energiser and Body Toner. For an idyllic afternoon, the Bridal Shower Package is extended to include full usage of the spa facilities (aroma steam, sauna, vitality pool and relaxation area), usage of The Ritz-Carlton, Macau Pool and more. Please see the appendix for details. To purchase or make an enquiry, please call +853-8886-6888 or email mhrs.mfmjw.sales@marriott.com.